THE FLOAT TUBE is a craft that enables you to position yourself in the water using only your feet, while your hands are free to cast. It’s like casting from your favorite easy chair. Getting into the water, however, can be a whole different matter. If your tube is the traditional style, start close to the water’s edge. Put your fins on, carefully step into the doughnut, slide it up around your belly, and carefully walk backwards into the water. While you’re walking backwards with fins on, be careful with your rod. Always carry your rod handle in hand, tip pointed forward, as you walk backwards. This simple technique could save your rod should you fall. Do not — I repeat, do NOT — try to walk forward in a pair of fins; you’ll be asking for disaster. With the more modern styles of float tube, the problems of walking backwards or breaking your rod can be avoided. All you do is simply sit down in your seat, put your fins on, and push yourself into deeper water. But whatever style of tube you choose, once in the water it will be like floating in air. The fins on your feet will be your power as you glide slowly through the water, casting toward shore or working the edge of a weed bed. Prices of float tubes range from under a hundred dollars for the traditional doughnut style to over three hundred for some of the more modern varieties. Not a bad price for a craft that can go places where a boat can’t go, and which you can carry over your shoulder. A U-Boat style float tube. Over the years, the belly boat has evolved from its perfectly round O shape into newer U, V, and even H shapes. New designs and trends have caused the classic belly boat to fall by the wayside, but not for everybody. Lee Haskins, one of California’s most noted and veteran float-tube anglers, is very familiar with the well-known waters of San Luis Reservoir and O’Neill Forebay, where several IGFA fly-fishing records have been caught from a float tube. Since these areas can be very windy, fishing with the wind is a constant issue, and Haskins has found that the round donut-style float tube is the lowest-profile tube available. Pontoons or U-boats, which have sides with more surface area to catch a breeze, can be tough to control when the wind hits the craft. Typically, these vessels sit higher in the water, presenting a bigger target — as well as more of the fisherman — to the wind. “In a round float tube, I can brace my knees against the bottom of the tube for leverage when kicking down,” says Haskins. He also finds that this helps conserve energy, and gives him more power in each kick. With this technique he can hold his position in waves, continuing to fish, while other crafts would require more energy to maintain position. 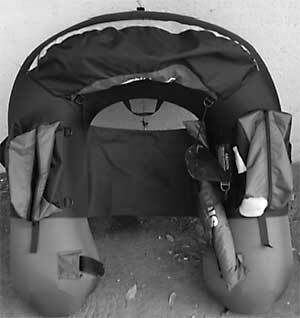 Most newer U-shaped float tubes are fitted with a bar to keep the tube ends from collapsing inwards. Another advantage of float tubes over other crafts is increased launching options. There are few other craft that you can carry like a backpack, and walk past the long line at the boat launches to the water or hike in to your favorite spot. Wind and waves rarely stop Haskins from fishing. He’ll judge the direction of the wind and select a launch point, which gives him an easy entry and allows him to kick across the waves, to the target fishing area. Once in position, he can then hold his position against the wind and waves, and use the former to assist his casting. The wind direction and strength always dictate the areas he fishes on both impoundments. Round floats use a truck tube, which is easy to repair and replace. Bladders, especially custom products, are quite expensive, and the seams have been known to fail and cause a quick deflation. Truck tubes do not have seams, and leaks are usually very small and insignificant. Haskins, in addition to the truck tube, uses an old truck tube, cut in half, as a sheath in the front half of the tube to protect it from fish-mediated punctures. This is a constant problem with striped bass, a primary target species in his home waters. There are advantages to the U- or H-shaped float tube. You can put one in the water, sit down in it, and then put your fins on. Some of the first U-boats (as they were called when they first came out) had a flaw. 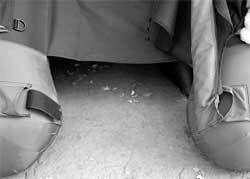 When an angler sat down in his tube, the two ends would collapse inward. The problem was corrected by installing a bar that was permanently fastened to one end. The other end could be connected to the other side, once the angler was seated. If that particular U-boat design is your choice, make sure it has the bar. But the ability to sit down in your tube and then put your fins on isn’t the only advantage of the U-boat. The Fish Cat, by Outcast Sporting Goods. The design of the Fish Cat float tube by Outcast Sporting Goods, actually shaped more like an A than a U, enables you to sit higher in the water. The back ends of the Fish Cat are welded together, providing a storage area in back and a higher, firmer casting chair. I have found that the A-shape helps you to move through the water a bit faster than the O- or the older U-shaped tubes. While it may lack an aluminum frame, the Orvis Day Tripper float is more pontoon boat than float tube. 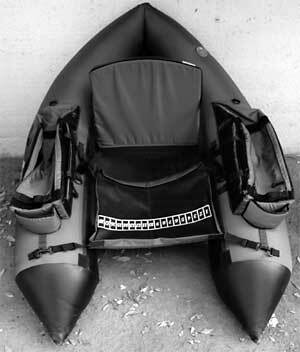 The Day Tripper’s H shape is formed by a foam seat with a pontoon sewn on each side of it. Another U-shaped tube, with storage bags incorporated into its design, is strapped down on top of it with hook-and-loop straps. On land, the Day Tripper resembles an easy chair more than any other tube design I’ve seen. In the water, it sits low enough such that you have excellent control with your fins, yet high enough to ensure that your casting isn’t hampered. A word of warning is advised. When driving up to those mountain lakes or streams, deflate your tubes or pontoon bladders to about three quarters of their normal size. Because they expand at higher elevations, there is a definite risk of over-inflation, and possibly bursting, that could occur. 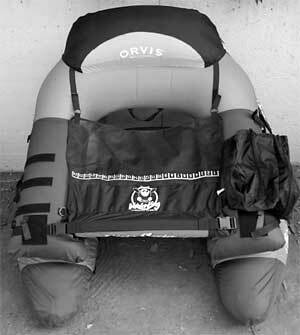 The Orvis Day Tripper float tube. The bladders of entry-level float tubes and pontoons are usually made of vinyl. Such a bladder will do the job of holding air, but it will not have the durability of urethane. Highly resistant to any puncture or moisture, urethane is considered the state-of-the-art material in bladder construction. Higher-priced U-boats’ and pontoons’ bladders are usually made of urethane (also known as polyurethane). For all your locomotion — getting from shore to your fishing spot, getting back again, or holding your position once you get there — you will be wearing your paddling power on your feet. 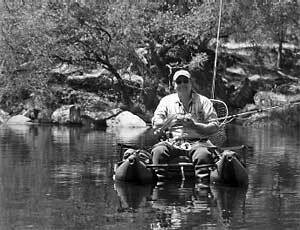 For me, one of the biggest pluses in a float tube or a pontoon boat is having my hands free for casting, while my feet are doing the work. And it is the fins that make this possible. There are two makes of fins with which I’m familiar: Caddis Float Tube Fins, which are around $30, and Force Fins for $100 and up. Caddis Fins are basic conventional fins that will do the job, although they are somewhat stiff compared to the flexible and light Force Fins. Stiff fins make for stiff paddling, while flexible ones bend as you draw your foot back for your paddle stroke and stiffen out when you push forward, providing you with more efficient paddling. Float tube fins. The pair on the left are by Caddis; the pair on the right are Force Fins. The beauty of float tubes is their simplicity; they don’t take a lot of skill. Once in the water, just paddle backwards; to turn around simply paddle with one foot. Within an hour it will be second nature. Before you know it, your natural abilities and your flipper-adorned feet will have you moving through the water like a duck. I do recommend that you take the care of your float tube seriously, because they can leak. Never go so far from shore that you couldn’t make it back if your tube did rupture. Float tubes can be used in a wide variety of waters, starting with ponds. Ponds and float tubes were meant for each other; a body of water too small for a boat, too deep to wade, and full of fish was probably the inspiration for the first float tube’s creation. Lakes are well within the purview of the float tuber also. As long as you use caution when you paddle a float tube, you can safely take advantage of all the possibilities and adventure a large freshwater lake or reservoir has to offer. Rivers require more caution, and you should know the stretch of river you’re targeting. Rivers collect objects such as fallen trees and who-knows-what-else after flood season. Submerged trees or stumps and strong current have claimed the lives of numerous unfortunate anglers. Consider the following story, which I heard years ago. A man was floating down a river, and got caught in a strong current that dragged him into a submerged tree. The current was enough to flip him upside down, and a limb from the tree caught and held him in that position long enough to drown him. How about the ocean? People do float tube in salt water, but the hazards are real. It’s not too unusual to read about the fly slinger who hooks a big fish, and gets towed so far out to sea that he almost loses sight of land. You won’t catch me doing a seal imitation in California shore waters. The ocean surf can, and has, tossed float tubers around like beach balls. Those currents and tides can be far more dangerous then anything that swims within. Wind is rarely a problem for the float tube-situated angler. When a strong wind blows, put your back to it, holding position with your feet while your hands are free to cast. You will be able to stay squarely on that hot spot, better than any fisherman casting a line from a boat. The simplest of personal crafts should be rigged, well, simply, and this is the beauty of the float tube. A good quality float tube is going to have pockets for storing fly boxes, lunch, and other gear. So the list of after-market accessories needed for rigging your craft should be small: two rod holders at the most, net, fish finder, and anchor. Remember: you want to be able to put it in your car or truck, head for your favorite waters, and be fishing a half hour or less after you get there. The float tube (left) and pontoon boat (right), when fully rigged. 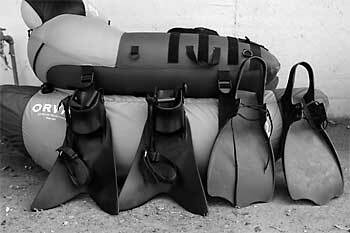 A Personal Flotation Device (PFD) is worth careful consideration. If your inflatable craft springs a leak while in the middle of a lake, you’re going to have to swim, and there’s all your gear — not to mention your safety — to worry about. Can you think of a better time to have a life jacket on? Fish finders can be a great help. Bottom Line’s Fishin’ Buddy with its tube adapter has always been popular with tubers. In the past few years, however, I’m seeing a lot more fishermen using console models on float tubes and pontoon boats, with adapters either acquired commercially or home-made. These options will serve in a pontoon boat as well, but in these craft it’s easier to remember to lift your Fishin’ Buddy out of its holder and not risk damage to the shaft, if you accidentally drag it over the bottom. In a pontoon boat you’re going to be moving faster when traveling from the launch point to your fishing spot and back again. Remember to remove the Fishin’ Buddy from its holder. The largemouth bass is but one of the many fish species that can be targeted when fishing from a pontoon boat. Storage: As far as storage goes, most pontoons have a storage bag you hook-and-loop fasten, or buckle down, for each pontoon. Accessory choices you made for your float tube will serve you just as well on your pontoon boat. So I will not repeat myself in the list below. Rod Holders: For about twenty-five bucks, Scotty’s fly rod holder with its float tube adapter can’t be beat. Leashes: Many a float tuber’s rod has found its way to the bottom of a river or a lake when he was changing a fly or taking a picture. A leash avoids this. 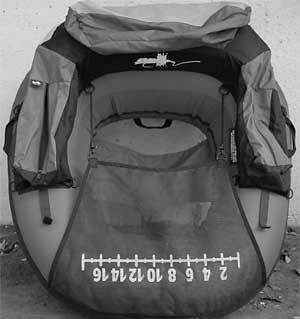 Fly Boxes or tackle bags: The float tube can function as a floating tackle bag that carries your gear as well as you. All I ever take is the box of flies I’ll need. Bags that can be fastened to the pontoons are usually included with the pontoon boat.